— A memetic line from Matthew's character in the American Godzilla (1998) remake. 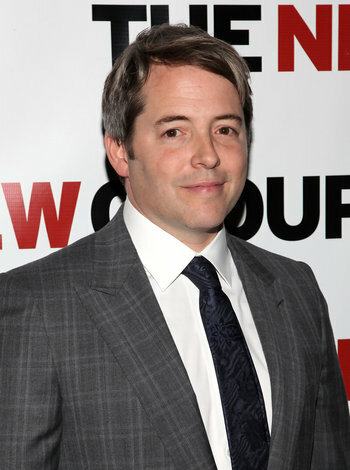 Matthew Broderick (born March 21, 1962) is an American actor famous for movies such as Ferris Bueller's Day Off, Glory, Godzilla (1998), and The Lion King (as the voice of the adult Simba). He started off as a teen heartthrob as part of the Brat Pack, but later moved on to more serious roles in The '90s, and has had some success on Broadway as well. He is married to Sarah Jessica Parker, with whom he has three children. Adam Westing: A car commercial broadcast during the 2012 Super Bowl featured Broderick parodying his Ferris role as a grown man. I Am Not Spock: He will forever be Ferris Bueller to the world, but Broderick himself has ruled out reappearing as the character and is rumored to be annoyed when people bring it up to him. However, he seems to have softened his stance towards the role; see Adam Westing. He has admitted he was miscast in Godzilla. His stance towards the 2004 remake of The Stepford Wives that he appeared in. Star-Making Role: Ferris Bueller's Day Off. Those Two Actors: Has teamed up with Nathan Lane on Broadway multiple times (The Producers, The Odd Couple, It's Only a Play) after initially teaming up with him for The Lion King (Lane voiced Timon). He was the first choice to star as Alex P. Keaton on Family Ties before Michael J. Fox got cast. In turn, ironically, Fox was the first choice to play Ferris Bueller. He was approached by AMC to take the lead role of Breaking Bad as Walter White, but declined, leaving the role to Bryan Cranston (creator Vince Gilligan wanted Cranston from the start but Executive Meddling forced Broderick on him, until Broderick himself turned it down).